Happy Sunday! 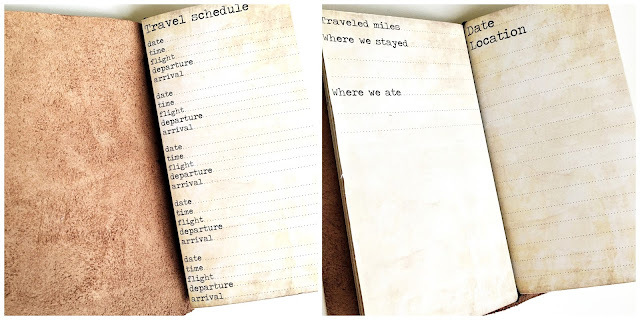 I'm totally hooked right now to the fauxdori travel journals. Last week I showed you my first attempt with a felt cover and it went way easier than I expected. So it was time for a real leather one. A few weeks ago I visited my local leather store and the place was awe-some!! Leather everywhere, in all possible colors. They usually sell leather for furnitures and other big projects, so they pointed me to a part of the store where they have leftovers I could choose from. I spent about two hours going through all the beautiful pieces. I love that every piece is unique and that will make each of my fauxdori's unique. 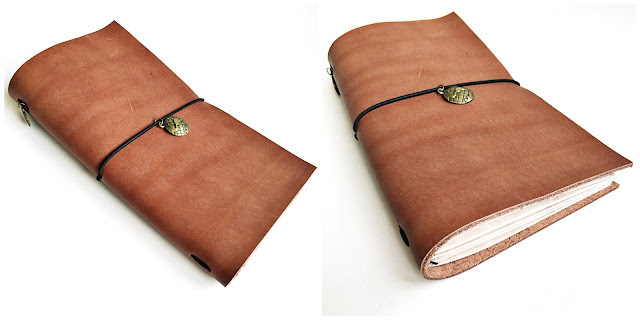 The one I've made this week is from a goreous piece of brown leather, which gives it some kind of vintage feel. I used black elastic band to bind it. The charm on the front is a vintage globe and the charm on the side is a coin to emphasize the vintage feel even more. For this one I've designed the inserts myself again. I used a digital paper from Sonya DeHart Design that mimics old paper and the font is Traveling Typewriter. I really love how it all turned out! I have bought more colors of leather, so more travel journals will show up here soon! Thank you for stopping by today and enjoy your Sunday!